I was up early to break camp and pack away my tent which was wet with dew. By 7.30am I was on my way to the coast path again as I had had to walk inland yesterday to find somewhere for my night stop. 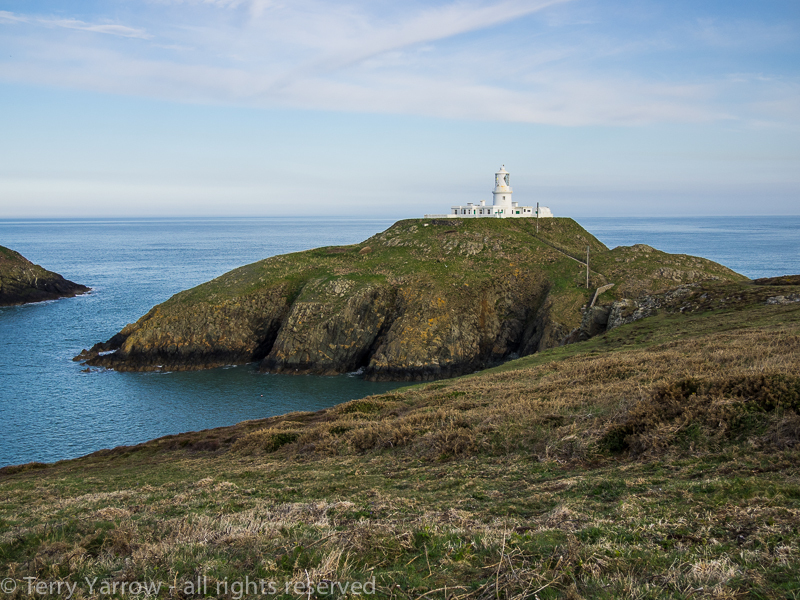 I soon passed the Strumble Head lighthouse which stands on Ynys Meicel (St Michael’s Island). This was built in 1908 to replace a lightship, previously moored off shore, and was one of the last to be built in Britain. The path was once again winding and full of ups and downs but the scenery was spectacular, especially on this glorious sunny day. 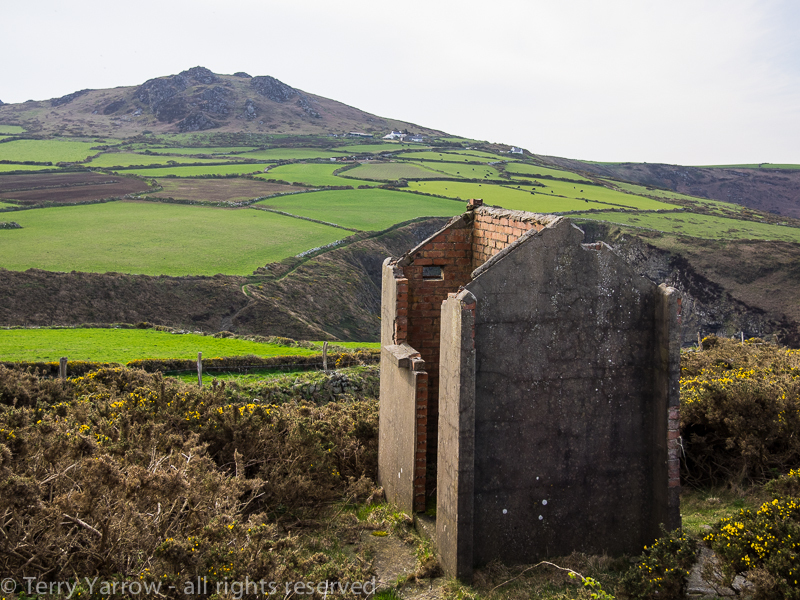 On this part of the walk, I passed various wartime relics, the remains of barracks, lookout posts and other paraphernalia, and the peak of Garn Fawr was ever present. Once again, I passed very few walkers along this stretch although there were a few people on the various beaches I crossed. The day was ‘energy sappingly’ warm and the path was rough and rocky for much of the way which meant that my feet became sore despite all the miles that I regularly walk. 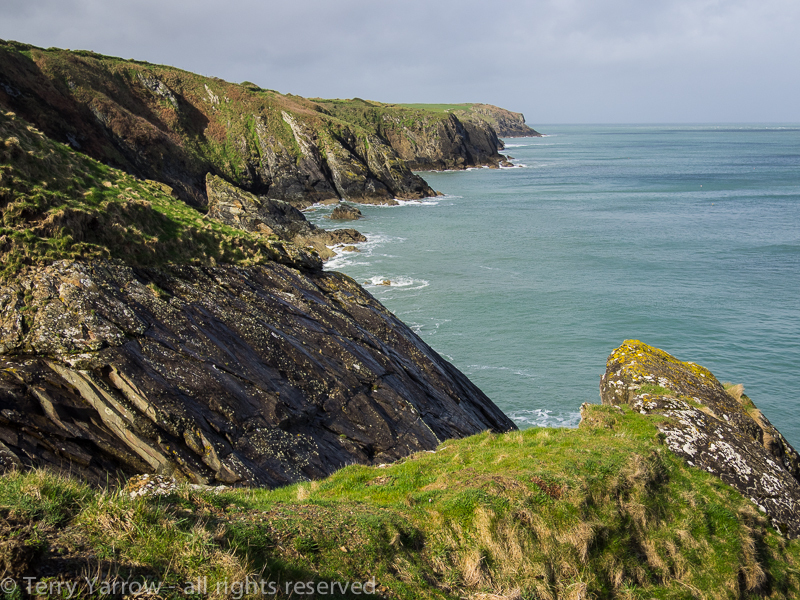 But the coast was beautifully rugged and there were stretches of flatter, easier walking. I passed a long dry stone wall that was apparently labelled by the builder, ‘The Great Wall of China’! After some miles I dropped down into Abercastle, another of those inlets that provided a harbour for trading vessels over a great many years. It was a delightful place with its cluster of cottages and remains from its past, a derelict lime kiln, an old granary and the remains of a lime-burners cottage. It was a place to linger awhile! 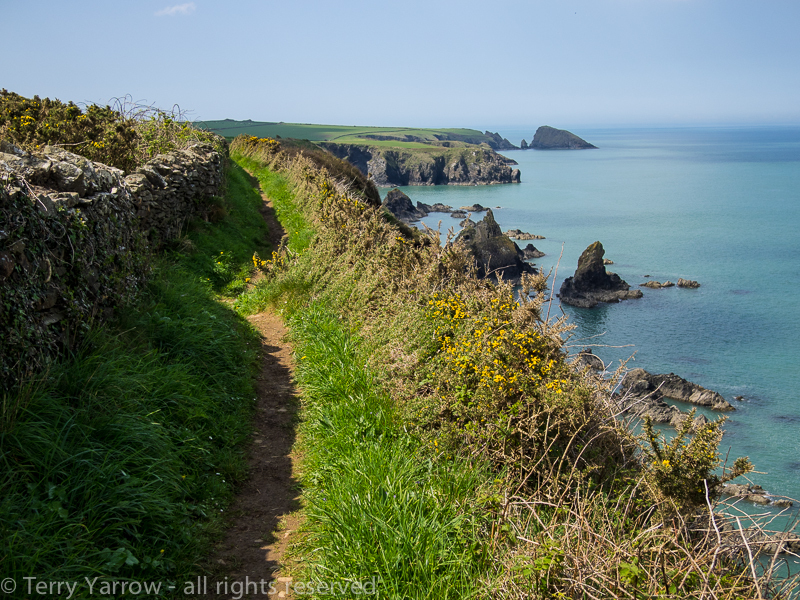 But I still had more miles to walk so after a short break I continued on my way, rounding the Pen Castell-coch headland with its soft grass and spring flowers, and skylarks singing overhead. Eventually I reached Aber Draw, the beach for Trefin, my stopping point for the night. 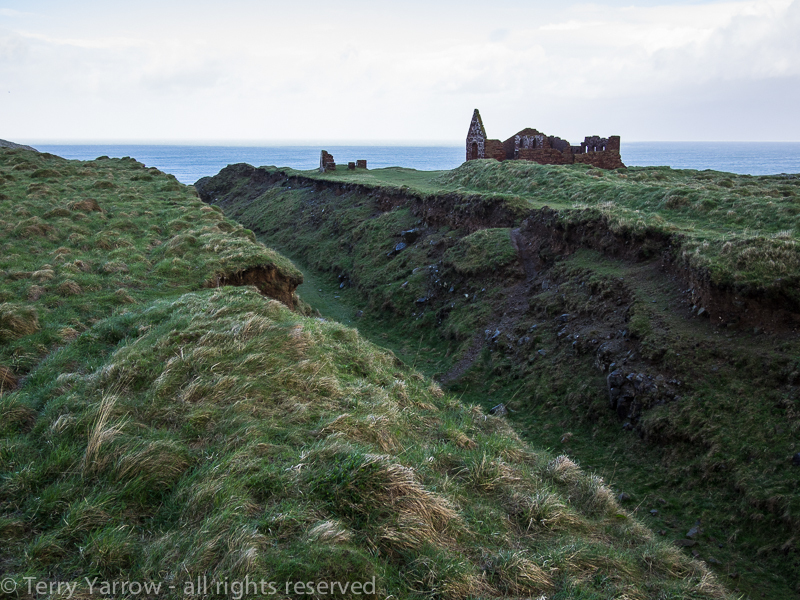 This is a mainly rocky beach but it has an interesting ruin in Trefin Mill, a once thriving corn mill that served the farming community in the 19th century. 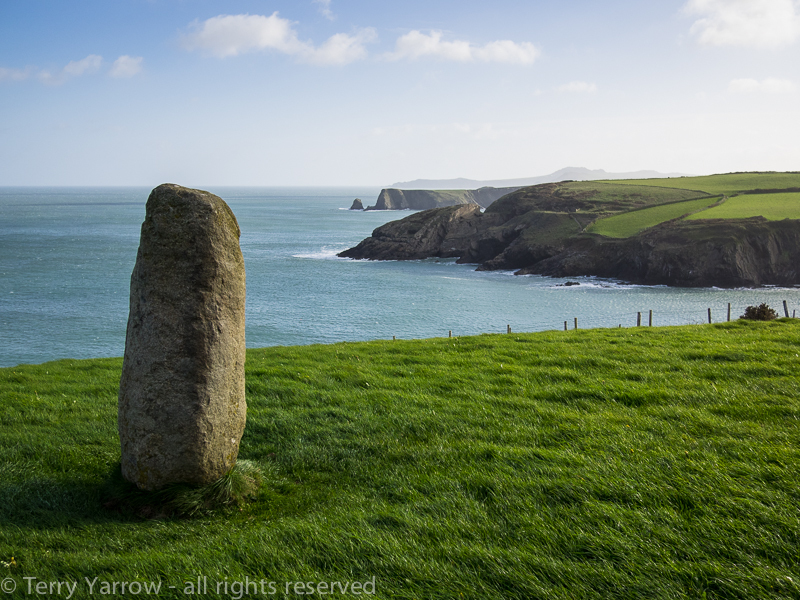 From this point, I made my way inland to find my campsite in the village of Trefin. I arrived at the campsite mid-afternoon and made the most of my time catching up on some laundry and drying of wet things. At this overnight stop, I had the benefit of a village pub so went there for a meal and to charge my phone. Whilst there, I met a coupe who were doing the same walk as I was although they were using B&B and baggage transfer rather that backpacking. Apparently we had passed each other on the trail yesterday! What a great day this has been with glorious sunshine and great views all day. Little did I know what was to come! Wow, what a night! Pouring rain and gusty gale force winds, my little tent got pummelled! Sleep was just impossible as there was so much noise from the trees and the flapping tent. I felt quite cut off in the sense that to get out of the tent, to go to the toilet for instance, would have been impossible without getting soaked and letting rain into the tent. In the dark, I wondered, ‘What if I haven’t pushed the tent pegs in enough, what if the tent leaks?’! But all was well and when morning came everything was still in place……and dry! In fact, after the awful weather of the night, I woke to sunshine………..but it wasn’t to last! I had breakfast, broke camp, packing away a very wet tent, and set off walking at 7.30am, retracing my steps initially down the road to Aber Draw. 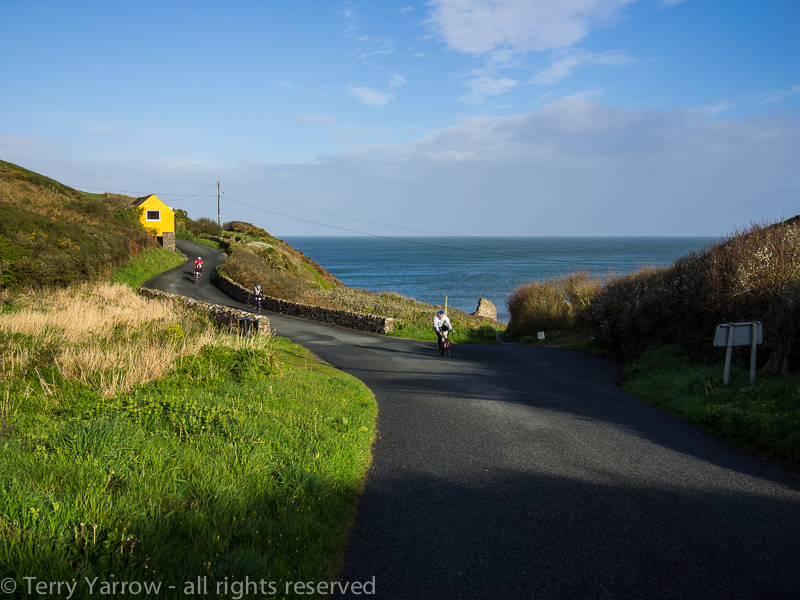 I didn’t have the road to myself as I was passed by lots of cyclists – this was the weekend of The Tour of Pembrokeshire. I decided that walking was easier as they struggled up the hill against the stiff wind! 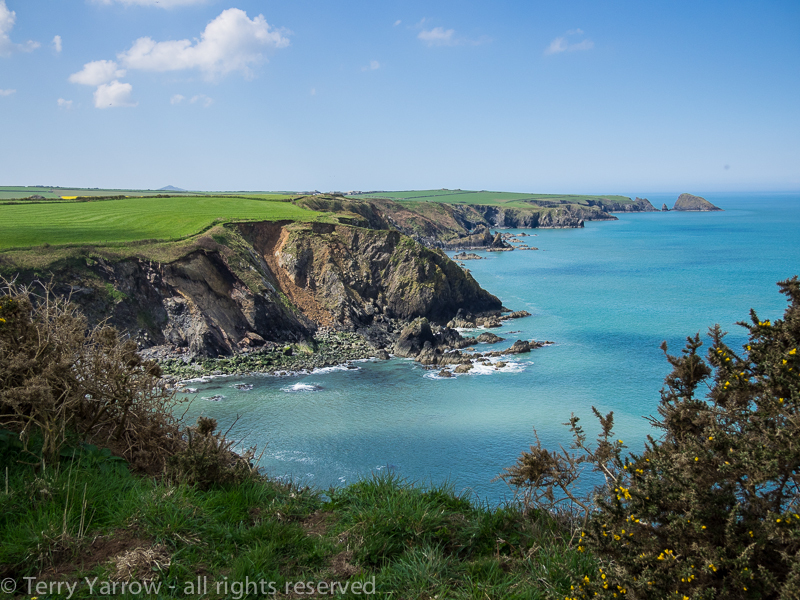 Soon I was out on the coast path again in glorious sunshine and I paused to look back at my route yesterday. 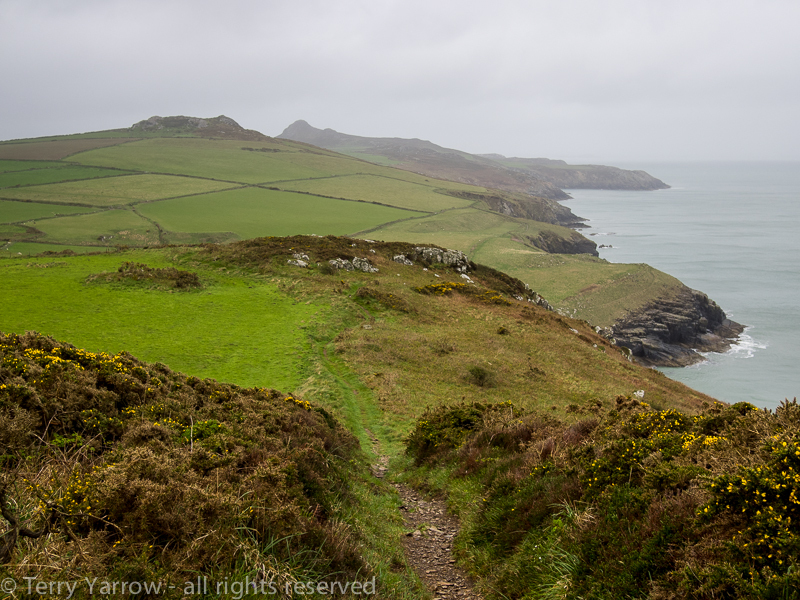 The walking was good and after just a couple of miles I dropped down into Porthgain one of Pembrokeshire’s really interesting places. With lots of industrial activity in the area, the little harbour was once used to export roadstone, slates and bricks and includes a large disused brickworks as well as lime kilns and other derelict buildings. 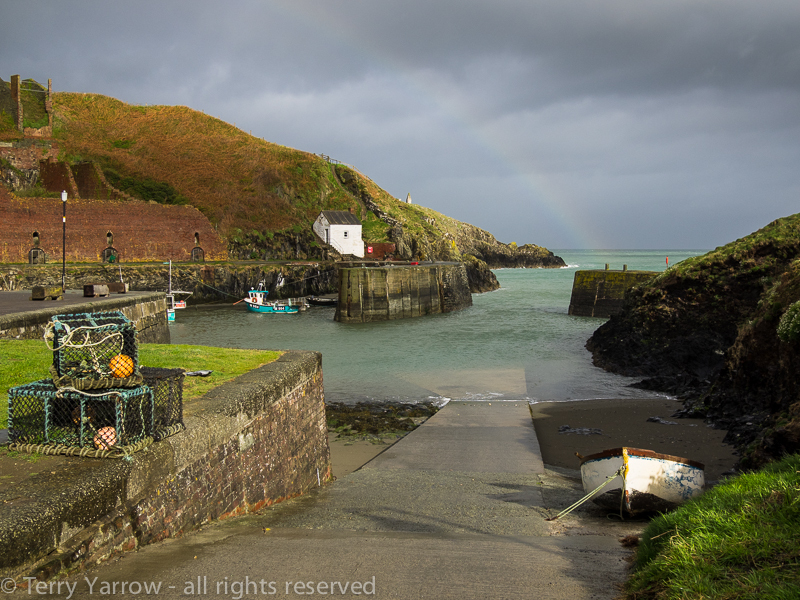 I stood by the harbour wall taking pictures just as the rain began to fall again! If you look carefully you can see the rainbow in the picture below. 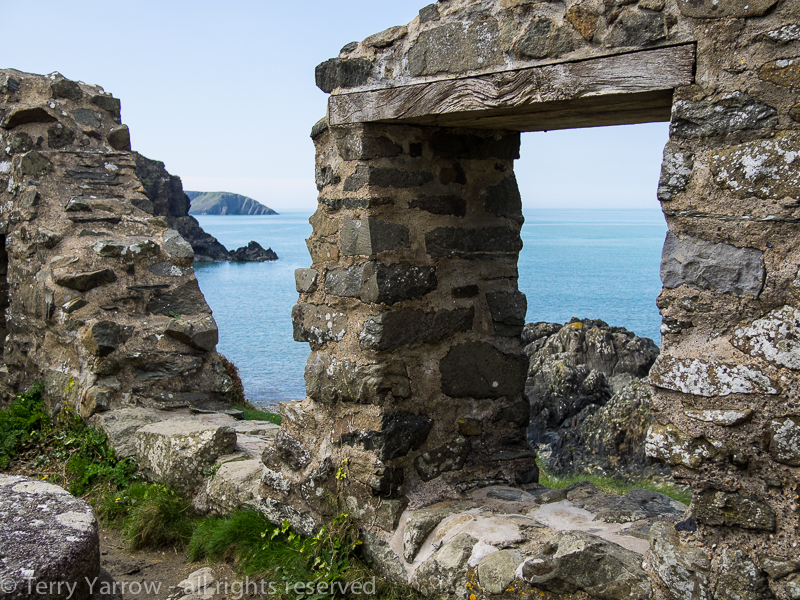 Climbing out of the delightful harbour, I passed the old pilot house and came across lots of remains from the industrial past with a large slate/shale quarry, including numerous derelict buildings and a deep tramway cutting. It was a place I would love to have explored but by now the rain was falling heavily! This again was a day of deep inlets that meant weaving a very crooked path as I walked around the various headlands. 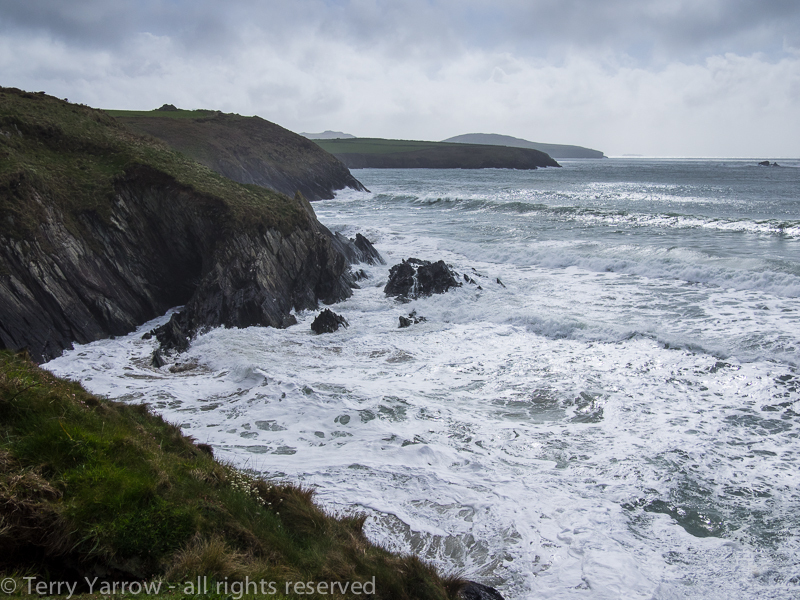 Visibility deteriorated considerably – it was perhaps a typical Welsh day! 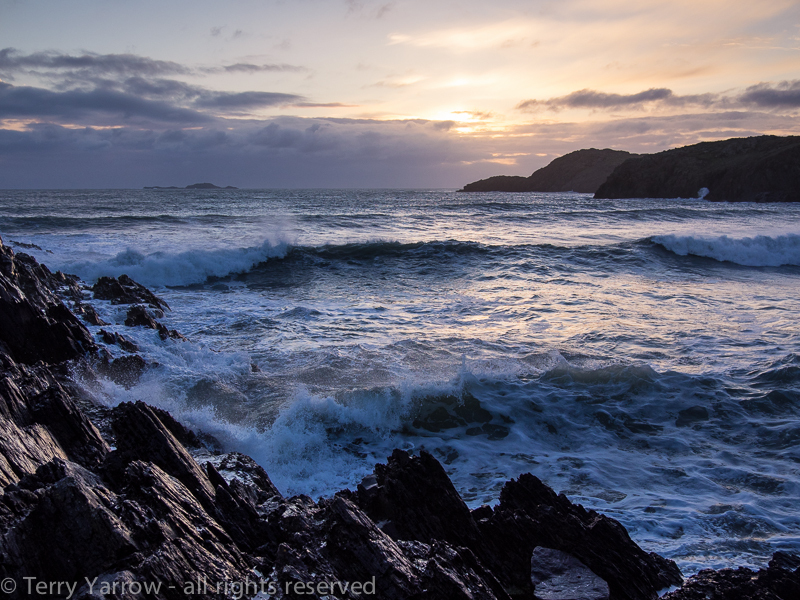 Occasionally the sun came out briefly and I took the opportunity to grab a few shots of this spectacular coast. But all too soon it was gone again and the weather closed in around me again. And what weather! The most appalling weather imaginable, pounding rain, powerfully gusting winds that were so strong it was difficult to walk against. Losing my footing constantly on the wet muddy and rocky path with its steep climbs, I fell numerous times despite being extra careful how I trod. The rain cover on my rucksack was ripped off time and again by the wind! 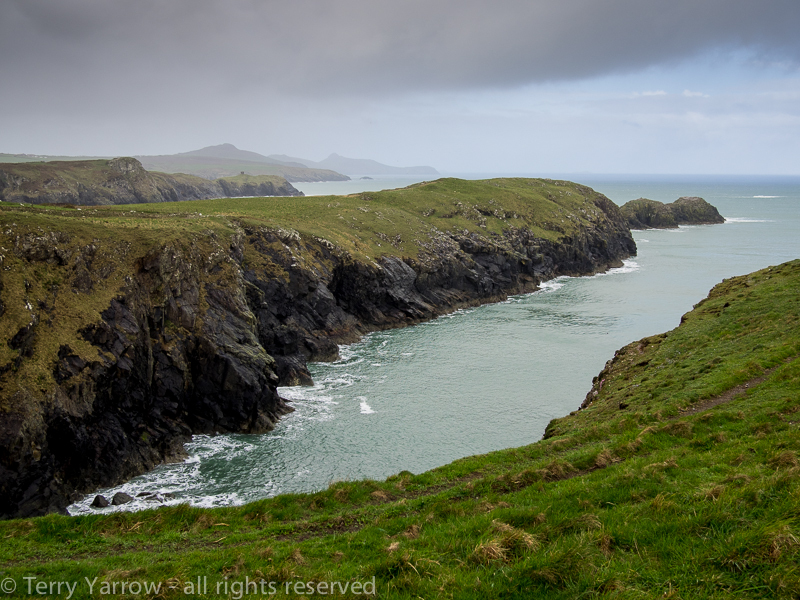 As hard as it was, the weather seemed to suit this coastline perfectly, bringing out its deep character. 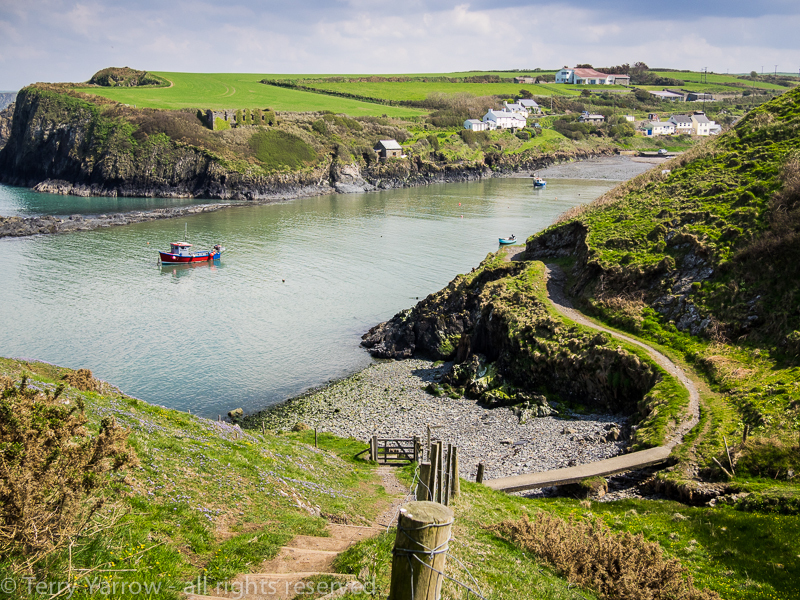 St David’s Head is in many ways reminiscent of the mountains of Scotland, North Wales and the Lake District – numerous rocky outcrops like mini mountain peaks. The only difference was that you had the sea on one side. Unsurprisingly I passed no other walkers until the welcome sight of Whitesands Bay appeared as I rounded the last headland of the day – this was to be my stopping point for the night. A day walker passed me by, shouting above the noise of the wind, ‘The forecast for the next couple of days is better’! I hoped so! 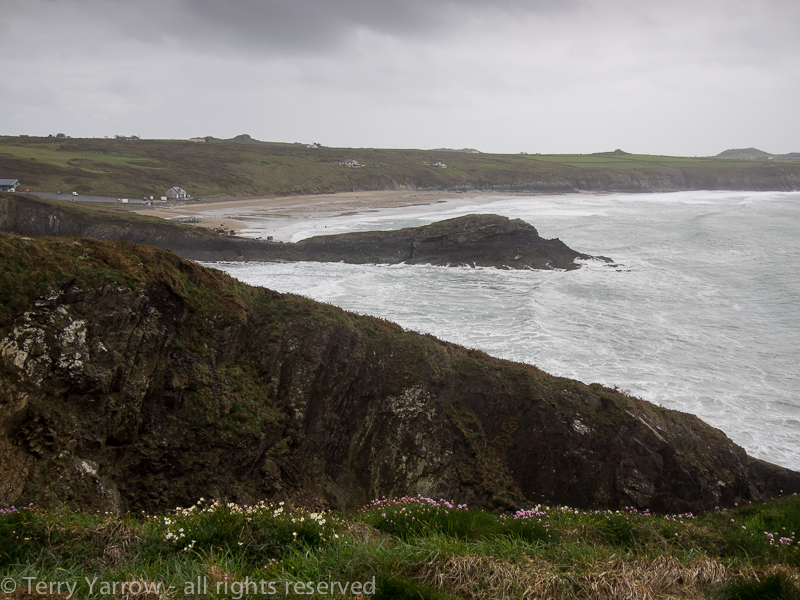 After hours of struggling to put one foot in front of the other against what was a solid wall of ferocious wind and rain, it was wonderful to drop down into the relatively sheltered Whitesands Bay………and there was a cafe there………and it was open despite the weather :)! I gladly sat down and ordered a pot of hot, steaming tea! Refreshed, I walked up the road to the little campsite that was to be my home for the night. Being slightly inland, this was a little more sheltered and I put my tent up in the rain. Later that evening, the rain stopped and I went for a stroll around the beach to check my route out tomorrow morning. The waves and surf rolling up the beach were a sight to behold. As I wandered back to my tent, the wind finally abated, the clouds began to clear and there was a beautiful sunset. What a difference an hour or two can make! I laid in my tent wondering what tomorrow would bring! Yay DR, I love it when you post! You never fail to impress with these amazing photos. The “Great Wall of China” and the “Abercastle” views are great! I’m so envious; I wish I too could throw my troubles (and all the burdens of city life) into the waves!